General eye care services at Barrett Vision Center LLC. in Altoona, PA are provided by Dr. Eric S. Batiste, O.D. He helps patients rest easy knowing that their eyes are healthy and that their vision in just about every environment is adequately supported. Good eye health does not just happen. It requires a combination of good personal habits and a doctor who is skilled at examining various aspects of the eye and measuring visual acuity. Periodic ocular examinations are a very important aspect of preventive health care. Many potentially devastating eye and vision problems have no obvious signs or symptoms. Therefore, affected individuals are unaware that these conditions exist. Early diagnosis and treatment of eye and vision problems are critical for maintaining good eye health and preventing vision loss. In addition, many symptoms and diseases that affect the eyes indicate a systematic health condition that may require referral for specialized medical care. Patients may require follow-up testing or may be referred to other doctors who specialize in correcting or treating specific health conditions. The examination process begins with the patient history, which helps to determine any symptoms the individual is experiencing. We check for the presence of any general health problems, medications taken, and will ask you to explain any occupational or environmental conditions that may be affecting your vision. The doctor will ask about any eye or vision problems you may be having, as well as questions about your overall health. The doctor will also ask about any previous eye or health conditions of you and your family members. 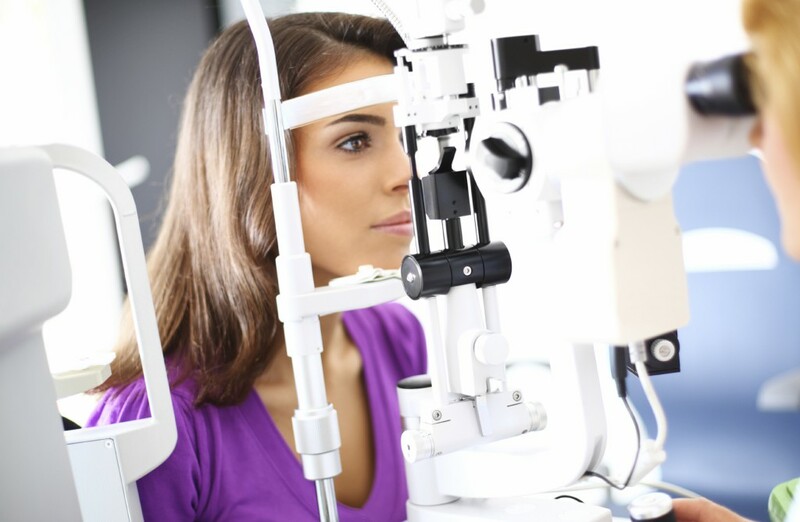 Visual Acuity testing is what many refer to as the traditional reading of the eye chart; however, there are other ways to determine vision accuracy. For example, we use alternate methods for some young patients who may not be able to read letters yet. We work with each patient to provide a full assessment. Visual acuity measurements evaluate how clearly each eye is seeing. As part of the testing, patients are asked to read letters on charts close up and at a distance. The results of visual acuity testing are written as a fraction, such as 20/40. Preliminary testing evaluates specific aspects of visual function and eye health, such as depth perception, color vision, eye muscle movements, peripheral or side vision, and the way your pupils respond to light. Each of these tests help Dr. B determine the state of your eye health and whether there may be any particular concerns or limitations. The clear, outer surface of the eye (the cornea) is measured by keratometry. This test helps the doctor see the curvature of the cornea by focusing a circle of light on it and measuring its reflection. This precision measurement is especially important when determining the proper fit for contact lenses. Dr. Batiste determines refractive error with a phoropter and retinoscope. These measure the appropriate lens power needed to compensate for nearsightedness, farsightedness, or astigmatism. Using an instrument called a phoropter, your optometrist places a series of corrective lenses in front of your eyes and measures how they focus light using a hand-held, lighted instrument called a retinoscope. There are also automated instruments that can evaluate the focusing power of the eye. The lens power is refined by the patient’s response in order to determine the lenses that provide the clearest vision to determine the optimal eyeglass prescription. This testing may be done without the use of eye drops to determine how the eyes respond under normal seeing conditions. In some cases, such as for patients who can’t respond verbally or when some of the eyes’ focusing power may be hidden, eye drops are used. The drops temporarily keep the eyes from changing focus while testing is done. Much of Dr. Batiste’s assessment of how healthy eyes are or how vision works for you is determined by checking motility for focus, how well the eyes work together as a team, and how well they move and work effectively together. The eyes must effectively change focus and move and work in unison in a standard way. Checking these aspects of the eye may show problems that keep eyes from focusing effectively or determine difficulties when eyes work at different levels. Pressure of the eye is measured by tonometry. When pressure in the eye is elevated, it signals an increased risk for glaucoma. External examination of the eye includes evaluation of the cornea, eyelids, conjunctiva, and surrounding eye tissue using bright light and magnification. Evaluations of the lens, retina, and back section of the eye may be done through a dilated pupil. This provides a better view of the internal structures of the eye. What is the Normal Pressure of the Eye? Normal eye pressure may range from 10 to 21 millimeters of mercury (mm Hg), many average pressures are about 14 to 16 mm Hg. Anyone with eye pressure greater than 22 mm Hg is considered to be at an increased risk for developing glaucoma; however, there are people with normal pressure who also develop it. Based on the assessments done by Dr. Batiste, further testing may be required. Dr. B. will explain whether he needs to rule out possible problems, clear a test that may show certain findings, or provide him with a more in-depth review. You can expect Dr. B. to evaluate the results of all the tests to determine a diagnosis and develop a treatment plan, if necessary. Dr. Batiste will discuss the nature of any visual or eye health problems found. If testing indicates a problem requiring surgery or other specialized care, you will be referred to another doctor or healthcare provider for consultation. Dr. B may continue to provide health care to you before and after the other procedures are done. If you have questions regarding any eye or vision conditions diagnosis or treatment recommendation, please do not hesitate to ask for additional information or explanation. Contact our office at: (814) 942-3200.